Chemical composition of groundwater is variable across the regions, geological formation and aquifers. The major inorganic constituents of groundwater comprises bicarbonate, calcium, chloride, magnesium, silicon, sodium, sulphate and carbonic acid (Candella and Movell, n.d; Department of Environment and Conservation, 2006). Trace constituents include boron, carbonate, fluoride, iron, nitrate, potassium and strontium (Candella and Movell, n.d.). Groundwater chemistry and quality is affected by a number of natural processes such as evapotranspiration, dissolution, and precipitation of soluble minerals, acid base reactions, ion-exchange and sorption and oxidation reduction reactions (Department of Environment and Conservation, 2006). Chemical behaviour of groundwater is influenced by temperature, ionic strength, pH and Eh (Department of Environment and Conservation, 2006). Presence or absence of arsenic, iron, manganese and nitrogen is influenced by pH (Marlborough District Council, n.d.). Geochemical processes determine the groundwater chemistry. 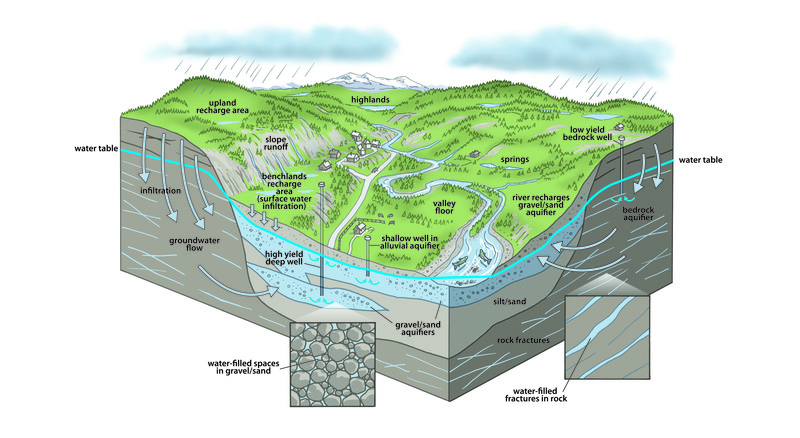 Mineralogy of the rock types forming catchments or aquifers, overlying land uses, proximity to the coast, source of recharge water, soil type, aquifer structure and the true water has been underground away from the atmospheric process are influencing factors of groundwater chemistry (Marlborough District Council, n.d.). H2CO3 is the common acid formed in the soil as infiltered H2O in the soil react with carbon dioxide (CO2) formed by the decay of organic matter and respiration of plant roots (Candella and Morell, n.d.). Land use activities such as soil cultivation, fertilizer application, animal grazing and wastewater disposal has important role in the availability of nutrients such as nitrogen and phosphorous in groundwater. High amount of nitrogen and phosphorous nutrients in the groundwater can have adverse effects on the ecosystem. Excessive nitrate and phosphorous increase the risk of eutrophication of lakes and streams from the growth of plant and algae resulting toxicity to aquatic ecosystems (Hanson and Abraham, 2009). Phosphate concentration is controlled by rate of sedimentation (Harbinson, 2007). Candela, L. and Morell, J. (n.d.) Basic Chemical Principles of Groundwater [Online] Available at www.eolss.net [Accessed on 17 June 2014]. Department of Environment and Conservation (2006) An Introduction to Groundwater Chemistry [Online] Available at www.dec.na.gov [Accessed on 19 July 2014]. Hanson, C. and Abraham, P. (2009) Depth and Spatial Variation in Groundwater Chemistry. Central Canterbury Plains [Online] Available at www.ecan.govt.nz [Accessed on 22 July 2014]. Harbinson, J.E. (2007) Groundwater Chemistry and Hydrological Processes within a Quaternary Coastal Plain: Pimpama, Southeast Queensland [Online] Available at www.eprints.qut.edu.au [Accessed on 22 July 2014]. Marlborough District Council (n.d.) Groundwater Chemistry and Quality [Online] Available at www.marlborough.govt.nz [Accessed on 19 July 2014].